We sell a covered call or cash-secured put and then the underlying company files for bankruptcy. What happens next? How are our positions effected? Let me premise my remarks by saying how unlikely this scenario is for investors who follow the rigorous screening process of the BCI methodology. But there is a difference between unlikely and impossible so let’s discuss the impact bankruptcy has on our sold call and put options for purposes of furthering the education process. Options are legal, financial contracts between buyers and sellers. They are not issued by, nor are they the responsibility of the underlying company. Options holders (buyers) have the right to buy or sell shares of stock and sellers of options have the obligation to fulfill those contracts. The risks and rewards of these contracts are contained between the two parties involved therefore the bankruptcy of the underlying company may have significant results for those involved with options. 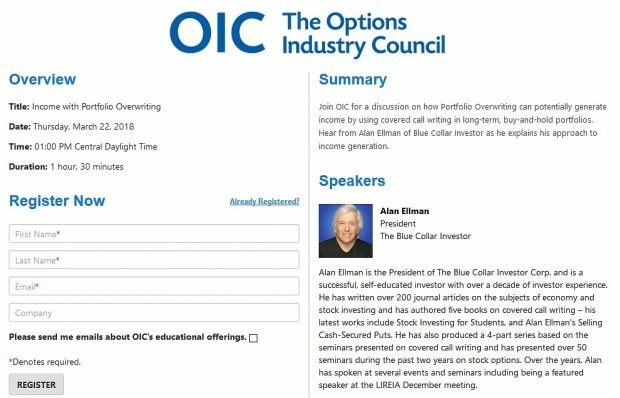 The delivery and settlement of every stock option traded on US exchanges is guaranteed by the OCC, the Options Clearing Corporation. What happens after a company files for bankruptcy? Trading in its stocks and options are suspended on the major exchanges and then trading of that company’s stocks and options moves to the Over The Counter (OTC) market or what is known as Pink Sheet market. 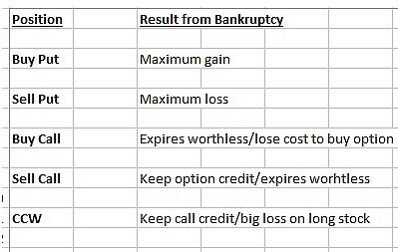 If you own put options on stocks of a company that has just declared or filed for bankruptcy, you are in for a huge reward. The delivery and settlement of every stock option is guaranteed by the Options Clearing Corporation. Whoever sold you that right to sell shares of that company at that higher price is obligated to fulfill that obligation, so your profit is guaranteed. If we sold a put option, we are obligated to buy the shares at the strike price despite the substantial price decline a bankruptcy filing causes. The short call expires worthless and the premium credit is realized. However, the long stock position will convert this to a damaging loss. Put buyers and call sellers benefit from bankruptcy filings. Call buyers will lose the cash used to buy the option while put sellers and covered call writers are the big losers. One of the reasons the BCI methodology uses a three-pronged approach to stock screening is to avoid such situations. It is highly unlikely that a company performing on elite levels from all three perspectives (fundamental, technical and common sense) would then move to file for bankruptcy. Highly unlikely but remotely possible. For the week, the S&P 500 rose by 1.64% for a year-to-date return of 1.41%. I had the honor to present a seminar on Friday April 1st at the Quinnipiac Global Asset Management Education Forum at the New York Hilton Times Square. The 3-day event included such speakers as Abbey Joseph Cohen, Bob Doll, JJ Kinahan , Ralph Acampora, Richard Bernstein, Jeffrey Kleintop and many other prominent financial experts. There were 1400 attendees consisting of college finance majors, finance grad students and finance professors from all over the US and abroad. This week’s Weekly Stock Screen And Watch List has been uploaded to The Blue Collar Investor Premium Member website and is available for download in the “Reports” section. Look for the report dated 04/01/16. I am referring to “mixed technical in general” This is when one or more is bullish/neutral and one or more bearish/neutral. In these cases, if I decide to use the security, I will sell an in-the-money strike. What are your thoughts on binary options? This concept has been becoming more and more popular.Personally, It seems that this is like a poker or a slot machine play. This looKS like it’s a very risky proposition. But is there any technical analysis or indicators that could limit the risk? I do not trade binary options so I can only give a very general response… a trader needs to understand the risks and rewards of these often-misunderstood instruments. Binary options are different from traditional options. These options have different payouts, fees and risks, as well as an entirely different liquidity structure and investment process. Be very careful before risking your hard-earned money with these “exotic options” just as I recommend with traditional stock options. These options are beyond the scope of this site. Unless I am reading this incorrectly it seems that the “GMI” comment is referring to June 6th and the buy signal is as of March 2. The GMI Index has 6 parameters and the “6/6” means that all six were bullish. It does not represent the date 6/6. I am a covered call fan… I have made my way up to paper trading following the BCI system. My question is about your stock evaluation criteria. As I evaluate stocks..the answers to the criteria tend to change over time. So, when do I make the criteria call ? is it based on one day ? or looking at the past week ? month ? Also, is the 100 Open interest rule a hard line ? When a stock price is trending sideways at or near the 20-d EMA, it is considered “eligible” if the other indicators are neutral to bullish. When we have a mixed technical picture, we favor in-the-money strikes. Technical analysis is as much an art as it is a science and no single indicator will decide our investment decisions. We look at all indicators that form a mosaic that leads us to a bullish-mixed-bearish overview. We eliminate bearish and use the other two if they pass all other screens. The requirement of 100 contracts of OI and/or a bid-ask spread of $0.30 or less is a guideline…okay to veer slightly. I recently found you when searching best ways to trade covered calls. I like what I see in your approach, search, calculations and how you place trades! I am however a bit confused about the “downside protection” You have said (I hope I haven’t missed quoted you) that this percentage is the amount that the stock can fall to and you would still profit. You’ve probably have answered this several times so I apologize for not finding the answer in your web content. As I see it using an example: I have stock that is trading at $42.85. It appears to be trading sideways. I’m thinking that the ITM strike would be best. The strikes are in $5 increments so I’ve selected the $40 ITM. It sells for $2.95. My intrinsic value is $2.85 this equates to $285 downside total. My downside percentage would be $285/$4285= 6.7%. IF I understand you correctly, If I take the $42.85 strike and multiply it by the inverse of 6.7% (93.3%) I would receive a price of $39.97 (round to $40). This would be the amount the stock could fall to and I could still recognize a profit. ? Can you break down how I would profit? If the stock was at $40.01 at time of assignment. My original purchase was $4285. At assignment I receive $4001 for a net loss of -$284. I collected $295 from the sell of the option so I’m still $11 in the positive. I assume that you have to go the distance to the option expiration, no “buying” the option to close. I would let the option expire. Is this the math? Are my assumptions correct? In my books/DVDs, I differentiate between “Downside Protection” and “Breakeven” The former, is the percentage a stock can drop in price and still generate the full time value profit. The latter is stock price minus the entire option premium. The formula for DP = Intrinsic value/Strike price. In the screenshot below, the red arrow points to the time value profit (only 0.2%) and the green arrow shows DP of that profit (6.7%). This means that your stock can decline in price by 6.7% and you still will have captured your max return of 0.2%. The purple arrow shows the BE column (stock price minus total option premium). A quick way to access a trade like this is to say to yourself…if I buy a stock for $42.85 and agree to sell it for $40.00, I am losing $2.85 on the stock sale and receiving $2.95 on the option side leaving me a net credit of $0.10 per share…let’s pass on this type of return. Thanks Alan! Got it. It’s always the extrinsic value that we are looking to profit on in a ITM strategy. In a OTM trade it is the extrinsic and the possible bonus of the appreciation of the stock price. Good stuff! Thank you for all the content that you have posted to the web! Much appreciated! I look forward to being part of the BCI community. Alan, and just for confirmation again of the above, so if the price is below the 20dEMA yet other indicators are mixed (or positive) then I could buy the stock to sell ITM options, – BUT with this same scenario at Expiration you will (as you tell me) just allow assignment (or buyback and closeout position)? This is what you meant is it? – I have read similar recent articles on SWHC, which says there is a ‘possible SEC investigation’ but it still doesn’t actually say the word “Lawsuit” anywhere. I don’t understand why they don’t make this clear. Is this because maybe they don’t want to say it, just in case flocks of investors turn around and sellout? – Also my personal decision for SWHC was to try ‘hit a double’. but there were 2 bits of information about this strategy I got from you, where I thought only 1 of them would be right. The latest in the 4 week contract to hit a double I am sure you said, was out to the end of the 3rd week maximum. But you have also said from the time a buyback order is put on, to wait up to only 1 week maximum to hit a double. Now the timeframes may coincide here if the buyback was at end of 2nd week, but not if it was say within the 1st or 2nd week. So if the buyback is earlier than the end of 2nd week then do I still give myself 1 week to hit a double, or could I give myself a little longer because of extra time in the contract? 1- Technical analysis is 1/3 of our screening process (fundamental analysis and common sense principles make up the other 2/3). Moving averages are 1/4 of that 1/3, making the moving average component 1/12 of our screening process. Moving averages are important but we don’t hang our hats on it and ignore the other indicators. That said, if a stock is trading sideways with he price bars (or candlesticks) moving slightly above and below the 20-d EMA and momentum indicators neutral to bullish, the stock is in play for all exit strategy opportunities should they arise. If, on the other hand, a share price moves substantially below the 20-d EMA especially on high volume, closing the entire position should be given serious consideration. On expiration Friday, if technicals are still mixed and we want to keep that stock, I would favor an in-the-money strike. The take-away here is that if price moves slightly below the 20-d EMA with confirming indicators positive, the stock is still in consideration for our portfolios in this or the following month. This, of course, assumes that fundamental analysis and common sense screening meet our system criteria. 2- The threat of a lawsuit and the lawsuit itself (if it comes to fruition) both represent potential risk. Our decision is whether we want to take on that risk. This is a solid company but a looming lawsuit could upset the apple cart. It all depends on the individual investor’s personal risk tolerance. 3- “Hitting a Double” is most appropriate in the first 2 weeks of a 4-week contract and the first 3 weeks of a 5-week contract. The rationale behind these guidelines has to do with the time value erosion (Theta) of our premiums and the opportunity to protect on the downside of a declining share price. I am a conservative investor so beyond those time frames I would opt to role down or sell the stock. However, these are guidelines, not hard-and-fast rules, so veering slightly is okay. It is a glorious spring day in New Orleans. Ironic I should have market worries on a pretty day like this :)! Sell in May will arrive early this year. The bounce off the lows appears tired. Earnings season looks bleak. And does anyone really want Donald, Ted, Hillary or Bernie as President? I suspect not…we will get who we get. There is a noticeable market trail off soon in Presidential election years on seasonal charts. Please be careful buying anything here. I received preliminary information that the Department of Labor will be ruling favorably regarding continuation of the use of covered calls in self-directed IRAs. I have not verified this personally but the source is reliable. That is extremely good news. I know you did personal lobbying on this one and we thank you! In hindsight please forgive my editorializing! It’s already been a long season with all the campaigning :). Many of our members breathed a sigh of relief regarding the DOL ruling. This was the opinion of my contacts from the start of the hearings but until we saw the final results in writing we couldn’t be sure. A great job by the Department of Labor and those who went to bat for our retail investor community. See the following link that includes a chart that specifies that that the proposal was modified such that all asset classes can be covered under the BICE. This change was in direct response to concerns raised that the limited asset list in the proposal from April would inappropriately limit investor access to vehicles and asset types that could be beneficial. Alan, how many days before Expiration do you feel is the best time to sell a Covered Call ? My preference is for Monthly options although we do have members who like Weeklys. I sell my options within the first few days of the new contract month (after expiration Friday). Some options, of course, are rolled out from the previous month (on or near expiration Friday).